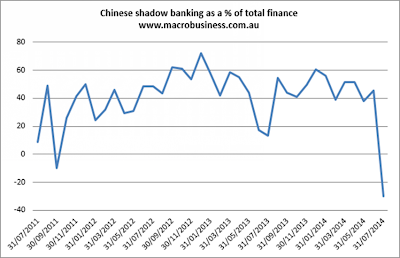 A major alarm bell just rang in China with the release of July credit figures according Macro Business Australia. 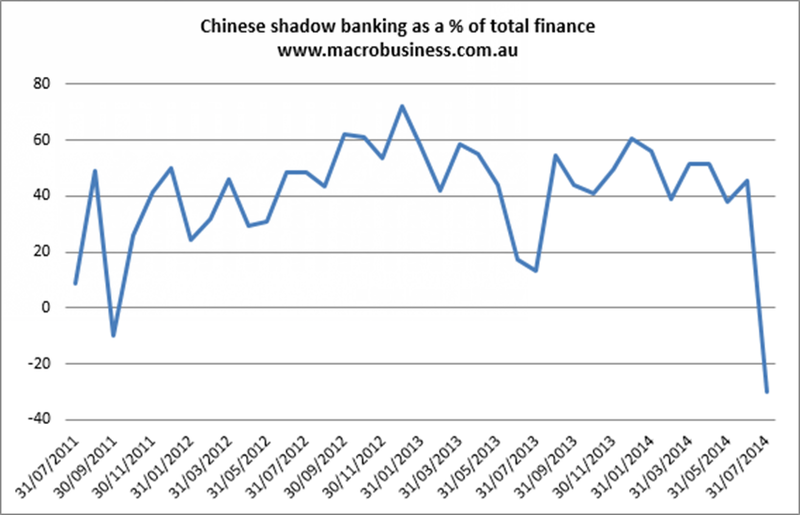 Chinese Credit Just Collapsed and shadow banking with it. Here are a couple of charts. New yuan loans were 385.2 bn versus 780.0 bn expected and and prior was 1080. 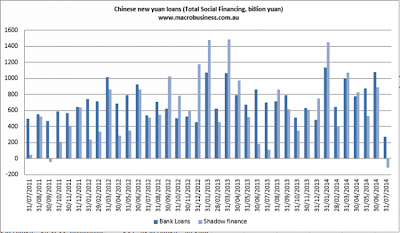 Aggregate social financing was 273 bn yuan versus 1500.0 bn expected and prior was 1970 bn implying that shadow banking credit contracted 112 bn in the month. Bloomberg reports China Record Bank-Deposit Slump in July Erodes Lending Capacity. China’s local-currency bank deposits fell by a record in July, eroding lenders’ capacity to extend new credit just as the world’s second-biggest economy shows signs of faltering. Yuan-denominated deposits fell by 1.98 trillion yuan ($321 billion) to 111.62 trillion yuan from the previous month, the central bank said today. That’s the biggest monthly decline in figures dating back to 2000. A plunge in China’s broadest measure of new credit last month and new yuan lending that was less than half of the median analyst estimate underscored risks of a deeper economic slowdown as a property slump bites. The Wall Street Journal reports China Credit Growth Declines Sharply. China's credit growth dropped sharply in July after surging a month earlier, reflecting Beijing's concern over a rapid buildup of debt in the world's second-largest economy. The growth of both bank loans and total aggregate credit hit their lowest single-month levels in over four years, although the decline in credit seemed to reflect moves by the central bank to rein in June's steep credit rise. Some economists suggested that it also reflected lower appetite for risk among banks. In an unusual move, China's central bank released a statement following the data's release. July's slower credit growth is still within "a reasonable range," it said, adding that it would maintain steady credit growth in the coming months. Stock markets in China and Hong Kong fell on the surprisingly weak data. 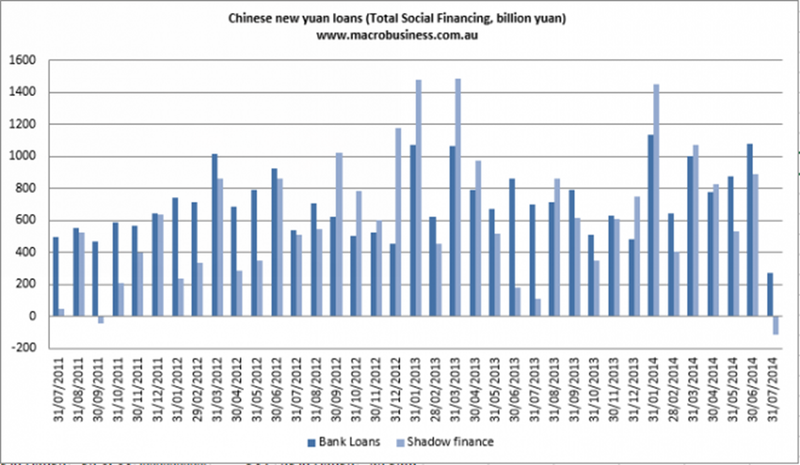 The sharp decline in total credit was due to slower growth in bank loans as well as a decline in nonbank financing activities such as trust financing as Beijing cracks down on the country's ballooning shadow banking activities. "If such slow credit growth continues over the next months, it will definitely affect the economy," said Standard Chartered economist Li Wei. However, the credit growth in June and July combined didn't fall far from historical levels, suggesting that July's weak level may represent a correction from the previous month's strong credit growth. Expect many more reports like these and dramatically lower GDP growth as well, if China makes any effort to rebalance its economy as I suspect it will be forced to do.